Plenty of kids (even big kids) are enamored of the thought of building their own working robots. The reality is, that’s usually easier said than done. Even some of the more renowned electronics starter kits are a bit too complicated or require too many advanced skills for young, inexperienced creators to grasp. If you’re looking for just the right kit to get a youngster started with robotics or even a career in a STEM field, the SunFounder Nano DIY 4-DOF Robot Kit is right in that sweet spot. Right now, you can get this cool introduction to building robots for just $42.50 from TNW Deals with coupon code: GIFTSHOP15. This robot’s name is Sloth… but don’t let that fool you, he’s got an armful of impressive functions to keep your favorite mad scientist busy for a while. 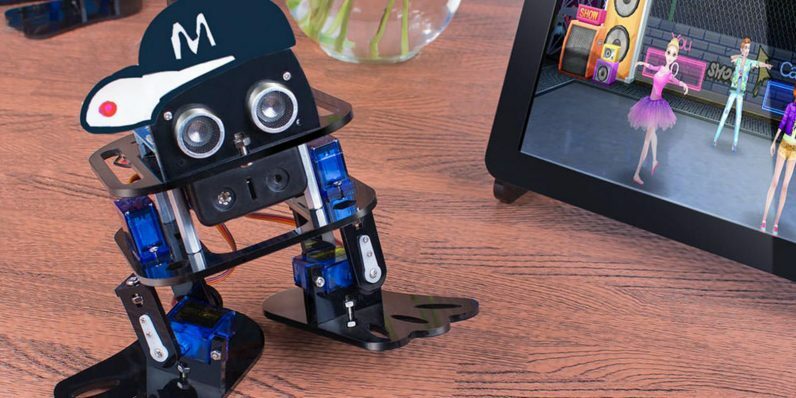 With a variety of pieces and programs included, Sloth can be assembled to perform all kinds of tasks, including walking, kicking a ball, or even dancing. Powered by a SunFounder Nano board (and compatible with Arduino projects), Sloth is also equipped with an ultrasonic range sensor to detect obstacles ahead and avoid them. Best of all, the visual programming language used for Sloth offers kids a much simpler way of controlling Sloth’s actions than typical complicated coding. From the build through the programming, it’s the perfect opening lesson for a child interested in technology. And it’s pretty freakin’ cute, too. With this limited time deal, get the Sloth robot kit now for just $42.50 until the offer expires with coupon code: GIFTSHOP15.